For our big joy we did not brake successful line. On Saturday, Adwin was judged by Mr. A. d. Brujin from Netherlands. This success he finished with Best in Show among adults tom-cats. On Sunday Adwin was judged by Mrs. Tatjana Melgaj Beccari from Slovenia. She wrote him very nice rating too. She got him fifth CACE and Adwin was nominated for Best in Show. 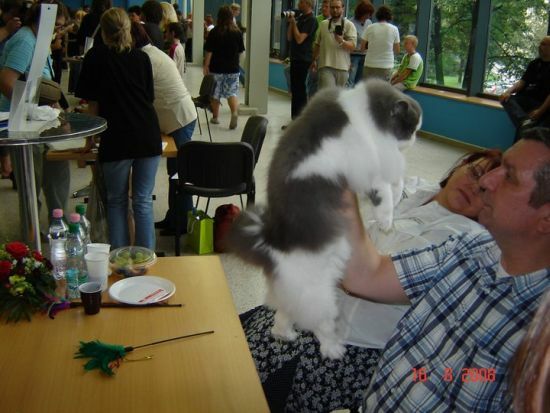 Sunday was caped with wonderfull success - victory in Best in Show among adults tom-cats. 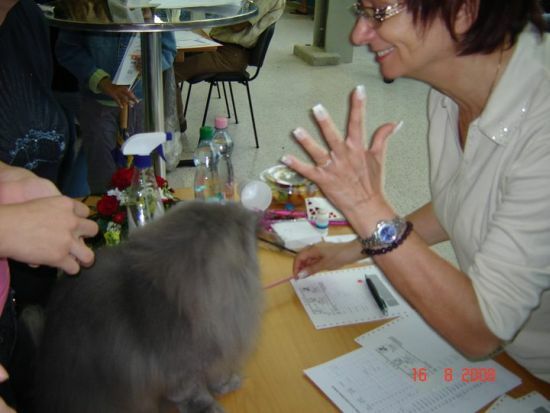 Our exotic tom-cat Boyo was on Saturday judged by Mr. Tatjana Malgaj Beccari from Slovenia. She wrote him nice rating and gave him CAGCIB. He was nominated among the other nice tom-cats for Best in Show. On Sunday was wrtitten another nice rating by Mr. Alessandro di Chio from Italy. Boyo got CAGCIB and he was nominated for Best in Show. On Sunday our darling persian bicolour Go-Go attended the show. He was alloted to Mr. Ad de Bruin from Netherlands, who liked him very much. Fine Touch was scored on Sunday, who participated like castrato. He was judged byMr. Eric Reijers, CZ. The first November's day we spent together with our tom-cat GIC Adwin at the International cat's exhibition in Vienna in Austria. A competition wasn't represented extra numerous, but the exibition was a full of quality. Adwin was judged by Mr. A.d.Bruijn from the Netherlands. Mr A.d.Bruijn liked him. He wrote him a beautiful rating, he got his first CACE and among a lot of other nice animals he nominated him for BEST IN SHOW. 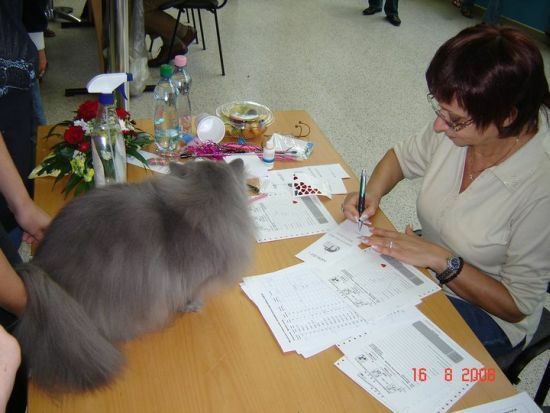 This success in BEST IN SHOW was interchanged by another success when Adwin became a winner among the adult's tom-cats and then in comparing with opposite sexes too. A huge triumph came when he became an absolute winner of the exhibition and he obtained BEST OF BEST 1 ! We congratulate him on his success and wishing him a lot of success. 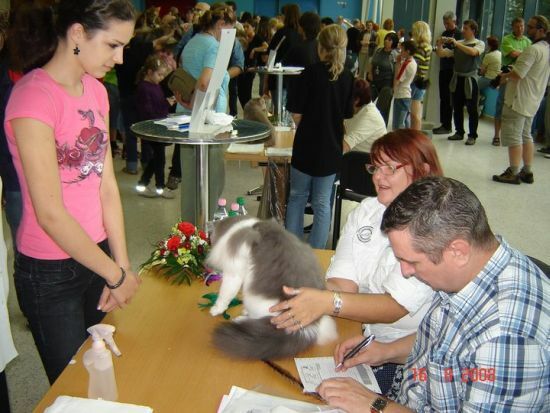 Our four boys Adwin, Boyo, Fajny and Go-Go participated on Saturday's International Cat show in Bratislava. Altrough there was not many persian and exotic cats, the competition was strong and good looking. But we have done quite well. Adwin was judged by Mr. Eric Reijers, and as always, he was impressed and highly evaluated due to beautiful large head, beautiful fur, excellent preparation, je pointed out its pretty big round and perfect colored eyes, small and well placed ears. Adwin got a perfect evaluation, second CACE title and BIS nomination in adult male cat's category. Business Boy (Boyo) has been judged by Mrs. Steinhauser, he received similar high evaluation and the first CAGCIB title. The judge mentioned its great head with well placed small ears and wonderful big eyes with perfect dark color. 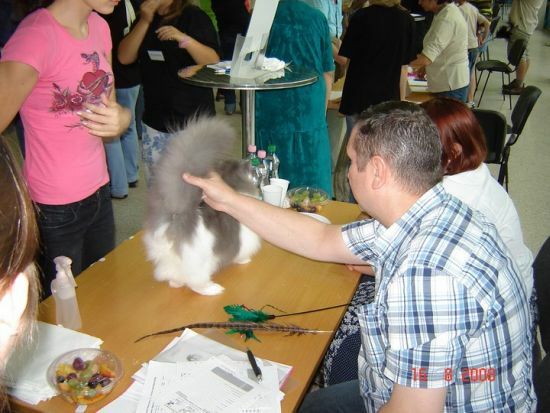 Fine Touch (Fajny) was also judged by Mr. Eric Reijers, who remembered it from past Cat Show in Ostrava and the impression was now the same positive as last time, mainly the well done preparation of beautifull long and bushing hair, set-up of colors and nice high forehead. Fajny received again an excellent evaluation and BIS nomination in junior category 6-10 months. Go-Go was assigned to Mr. Sagursky, who gave him an excellent evaluation, where he pointed out the long dense hair, pretty head with giant eyes and compact body on short strong legs. He was highly impressed by his fox-like tail. Same as his brother Go-Go got a BIS nomination. Well done boys, we are happy with all of You and sending lovely CONGRATULATIONS!!! 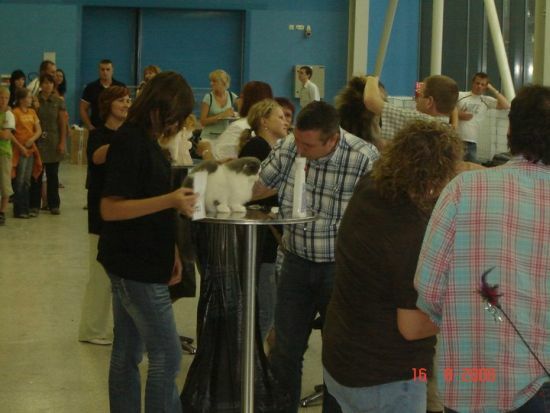 This time we took part in International Cats Show in Ostrava in Czech Republic. We had there our three boys Adwin, Fajny and Gogo. As first we took Fajny for review to Mr. Eric Reijers, CZ. He liked Fajny from the first moment, he wrote him beautiful rating, he higly evaluated his beautiful hair and preparation and he gave Fajny a nomination for Best in Show. Our second was Gogi as well rated by Mr Eric Reijers and he wrote him another beautiful rating with evaluation EX 1 and he liked his amazing big eyes, beautiful hair, preparation, he really liked Gogi. Last one was Adwin, we waited for the rating long time but it went well :-).He was rated by Mrs. Laura Burani, N. She rated him a couple of times before and she always really liked him, he always got high rating from her and he got it also this time. This review has big hearth through the whole paper :-), it is very kind. 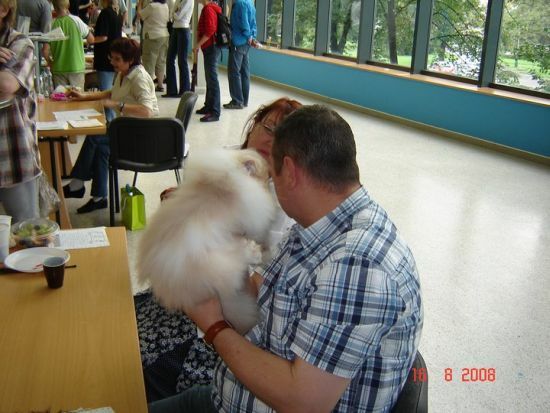 She highly rated everything – perfectly conditioned hair, eyes, beautiful expression, ..... he got his first CACE for European champion and she nominated him for Best in Show :-). We nervously waited in Best in Show, his superiors were on very high level. At the end we were very satisfied, Adwin won Best in Show again in adult male category :-) ! So we can say, that this show was successful too and we CONGRATULATE to our boys again!!! We took part in Cats Exhibition in Bratislava with our four boys Adwin, Boy, Fajny and Gogo on Saturday. Everyone got beautiful reports, in the concrete GIC Adwin Zhao Magic Pleasure, SK – Adú, as we call him at home, from Mrs. S. Bruin from Holland, who really liked him, she rated him high in everything, she totally liked his expression, head, eyes, amazing and great conditioned hair, etc. And together with the great rating he also got Best in Variety and nomination for Best in Show. With last CAGCIB he also completed terms needed for the title Grand Inter Champion. We enjoyed the most, when he won Best in Show with unanimous vote :-). IC Business Boy Magic Pleasure, SK- called Boyo at home, was rated by Mr. E. Reijers, CZ, who also wrote him great rating, he highly rated his beautiful big head, eyes, hair condition, he also kissed him during his review and he also nominated him for Best in Show and with last CACIB he completed terms needed for Inter Champion. On his second show was also our Fine Touch of Magic Pleasure, SK – home called Fajny, he was rated by Mr. G. Mantovani from Italy, he highly rated his beautiful arched forehead, perfect hair condition, beautiful eye color, etc. He wrote him beautiful rating and he also got nomination for Best in Show. On his first show was also our goggle-eyed Go-Go of Magic Pleasure, SK, home called Gogista, Gogi, Gogíček . He was rated by Mr. Shchukin from Netherland, whose rating we watched on other cats and we found out that it is really strict. Despite he liked our Gogi, from the first moment we put him on his table, the review was followed by a lot of kisses. He highly rated almost everything, he really liked his huge eyes, beautiful long, dense and perfectly conditioned hair, great figure on strong, short legs, big round head, etc. he wrote him incredible rating and as the other boys he also got nomination for Best in Show. So the show went great, we are totally satisfied :-) and we CONGRATULATIONS to all of our boys!!!! !